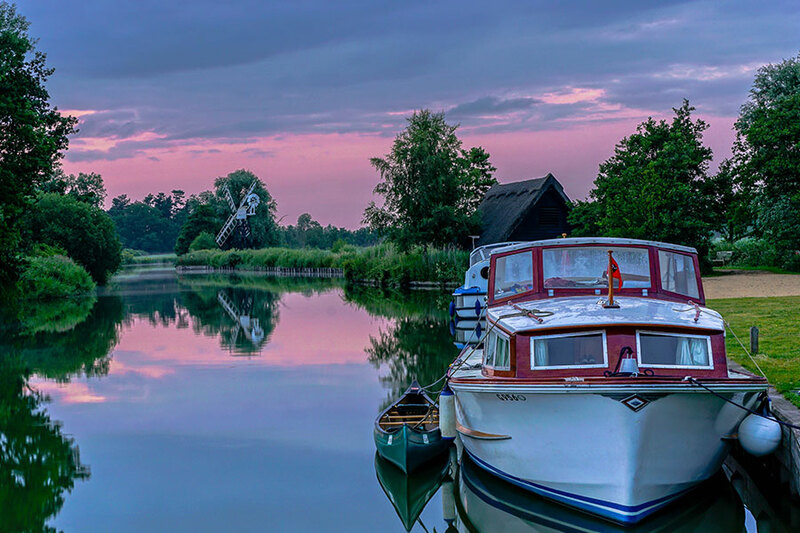 The Norfolk Broad is Britain’s largest protected wetland and third largest inland waterway, with the status of a national park and home to some of the rarest plants and animals in the UK. Made up of 43 separate Broads and six rivers they are connected by over 200km of lock-free navigable waterways. Its beautiful wild expanse of shallow lakes, woodland, fens and grazing marshes are a natural wonder waiting to be discovered. Visit: www.broads-authority.gov.uk for more information about the best way that suits you to navigate your way around. There are many boat yards within half a mile with various shapes and sizes available to suit your specific requirements. At the height of summer it is best to book before you come. Hickling’s nature reserve has a superb circular walk, and there are plenty of marked trails for visitors to navigate their way around, plus bird hides, an observation tower and viewing platforms. A superb way to experience Hickling Broad’s beauty is through one of Norfolk Wildlife Trust’s guided wildlife boat tours. The water trail takes you through quiet backwaters to two bird hides out on the Broad and also a 60’ tree tower with breathtaking views across the Reserve. Three trips run daily from Easter to the end of September at 10.30, 1.30 and 3.00 with a 15 minute walk to the boat landing stage. Booking is advisable by telephoning 01692 598276. Click here to book and download a timetable. Take a look at Steve & Lindsey’s recent experience of enjoying the beautiful wildlife and scenery while staying at Hickling Campsite! Norfolk is famous for its man-made Broads! A National Park with 125 miles of navigable waterways. In the 12th Century, the extraction of peat was a prosperous industry and provided fuel for both individual families and manors, with a greater proportion being sold. Digging took place throughout the east Norfolk settlements until the 14th century, when finally, nature overcame man’s force. The holes that had been created gradually began to fill with water as the sea levels rose. As flooding was taking place on a regular basis and peat extraction was simply no longer possible. As these man made holes began to fill, the Norfolk Broads came alive! 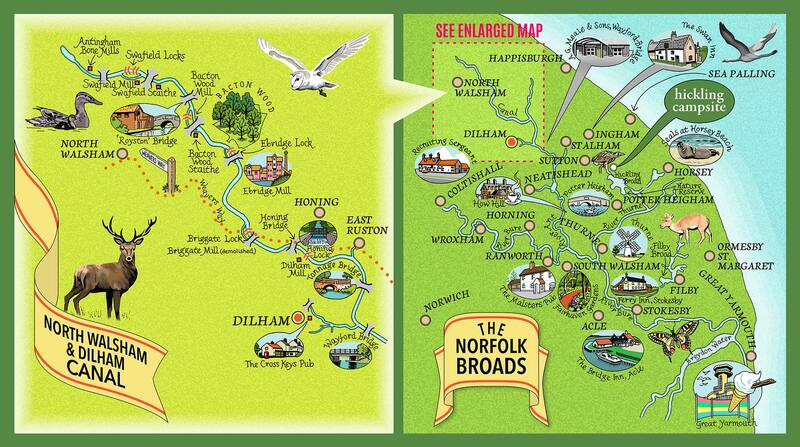 Check out our superb map of the Broads to help you to get your bearings of the Broads and all they have to offer!